Tami Simon: You are listening to Insights at the Edge. Today I speak with Mariana Caplan. Mariana is a psychotherapist, a cultural anthropologist, and a professor or yogic and transpersonal psychologies at the California Institute of Integral Studies. She is also the author of a new Sounds True book, Eyes Wide Open: Cultivating Discernment on the Spiritual Path. I spoke with Mariana about some of the thorniest big questions of spiritual life, questions about enlightenment and is enlightenment even a useful term, questions about the teacher/student relationship, and about what makes someone "spiritually mature." Here is Mariana Caplan on cultivating discernment on the spiritual path. Tami Simon: Hi. You are the author of a new Sounds True book, that I am so pleased that Sounds True has been able to publish, Eyes Wide Open: Cultivating Discernment on the Spiritual Path. And what I am curious about to begin with is in the writing of this book what you discovered that you didn't know before you wrote the book. Mariana Caplan: I think the best response I can give to that is when we enter into this whole field of spirituality that you and I have both been doing most of our adult lives, it is obvious that it is complex and that there is mind fields and that there is a big underbelly, but I think because the task of this book was to really go in there and take apart and articulate, I think more than anything I came to appreciate the endless and subtle degrees of complexity that we are dealing with, with all of these subjects. And how most things that it is easy to have a conviction on or see it a certain way…if you keep going with it, it is also very plausible to see it in another way. And depending where somebody is at and at what stage in their life they are at and an endless labyrinth of complexity that I don't think really stops. So I know a lot of people in spiritual things say it is all simple, and I think it is pretty complex, really. I am sure that there is some level at which it is simple, but I think for most of us a lot of the time, it is advantageous to appreciate the complexity of it. Tami Simon: Now you use this term "cultivating discernment" on the spiritual path. And I am curious both what you mean by discernment and how that might relate to what you are talking about now in terms of complexities or nuances. 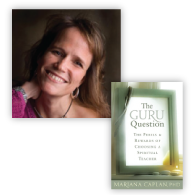 Mariana Caplan: So although I have been writing about discernment, I think I really got turned onto the term from one of Patanjali's yoga sutras, because I am very involved in yoga studies and practice. And there is a particular sutra that talks about the need to cultivate discernment, and that discernment is such a powerful took and shield that it has the capacity when cultivated to pierce through untruths at every level of our experience, from gross to subtle. So what I would mean by discernment is really like the piercing capacity to navigate subtle distinctions with clarity and not intellectually. I mean, first intellectually, but practically. Does that answer your question? Tami Simon: Well I am curious; you use this word "shield." How is discernment a shield? From what? Mariana Caplan: I think it is protection. I think that when we learn to look at this labyrinth of our psyche and the labyrinth of spiritual path and the trajectory with increasing degrees of clarity, and some of learning to do that is going to come through our experience, some is going to come through our studies, some if going to come through unveiling ourselves to real feedback from others. That this becomes our protection, because when we cultivate that capacity and refine it then we can bring that to whatever situation we are in. But I don't think it is something that is cultivated in a certain period of time and then you are done cultivating it and then you are set. I think it is just a process of increasing refinement without end, really. Tami Simon: And do you think some of that refinement is what you described in the beginning of our conversation about being able to see things from many different perspectives? Mariana Caplan: To see things from many different perspectives and then more importantly, the degree to which we are able to see ourselves with real self-honesty. So I think that part of the discernment is being able to know what we are dealing with externally but that the greater capacities come when we are really willing to be revealed to ourselves and be raw. And that the kind of capacity for seeing that often comes through being broken down and broken open and from the harder lessons and not just the shining dharmic diamonds showering on us. But what happens after the diamond shower and we've gone home and screwed up in our relationship with our partner one more time? Or been rude in a way that we know is totally dissonant with what we believe in? That is a lot of what forges discernment—if we are really willing to meet that and look at ourselves clearly. Mariana Caplan: Well I don't think it automatically leads to discernment, but it leads there when we are willing to look more honestly at ourselves and allow ourselves to experience ourselves where we are at. We've been exposed to the great teachings, we love them, we connect. That is really true of us. And then many other things are also true of us. And I think we often want to overestimate, or I guess we could flip into self-hatred on the contrary. But in between is just really meeting life raw, as we are, with our greatest ideals and capacities and our weakest links and engaging our process from there. And I know you've spent at least a couple of decades meeting the great teachers, and I have in my own way, and continually the ones who touch me are not necessarily the ones pouring out those diamonds but the ones that are so real. When you are in some crowd with a great Buddhist lama and he will start his talk by saying, "God, I want everyone here to like me." Everyone goes, oh! Things like that. And more and more I find those are the sweet moments where there are teachers, who are great teachers, who are willing to address themselves and us as we are. I saw the Karmapa in January, I'd taken students from the university, so we were listening to him speak for several days, and he said something…there were 5000 monks. It was this huge gathering, and they were from all over India and Southeast Asia. And he said, "The hardest thing that you are going to encounter on your journey is the challenge of dealing with your own emotional lives." And I was so touched by that. That seemed so real to me. Tami Simon: That definitely hits home here when you say that. Mariana Caplan: That we are trying to make distinctions and navigate through the "spiritual life" that is here in our real lives. That is what I am interested in, because I think that is where the integration takes place and that is where the exemplars arise from and the people who move and serve the world, at least in the way that I am interested in seeing it moved and served. Tami Simon: When you say that is where the integration takes place, what are we integrating? Mariana Caplan: I think we are integrating that part of us that is touched by that great spark. I mean anyone who is reading the books from Sounds True or listening to something like this might evolve or be touched, and then there is our entire psyche and psychological reality. There is our cultural reality. There are our karmic lineages. There is a lot of stuff. And most of it is contained in our bodies and it is contained in our psyches, and it is like we are taking that light of awareness and bringing it to all the nooks and crannies. And I am particularly interested in bringing it to the cellular structure of our body and little by little penetrating all levels of our experience with that awareness. But little by little. Because I think that is the way that it happens, and maybe that is just a result of growing up on a spiritual path and watching my ideals when I was younger and watching different teachers and communities and myself over many years. And being humbled by the process. And it is so easy for people on the spiritual path for people to try to be humble or act humble or talk humble, but then when the process and the path knock you down or life knocks you down in that way, then a softer relationship to all of this seems to emerge. Do you think? Tami Simon: I do. But not to be too contrarian here, but to bring up a different perspective. You know, little by little, little by little. Well, that certainly has been my experience, and I think probably the experience of most people I've met. But then you have an example of someone like Eckhart Tolle or other people where there is a sudden huge shift in their cellular structure, or so it seems, how do you make sense of something like that? Mariana Caplan: I think in one of my other books I mentioned this, and I think it happens. And let us each hold a place in ourselves that that could be true of us, because we don't want to miss that window if it is suddenly opened. So I appreciate it, and then encountering enough thousands of spiritual practitioners and serious and diligent ones and noting that it happens to a few. One in every tens of thousands. And may that shift and may it be each of us. And we can practice with diligence, regardless. But I think there is a way or maybe part of a process that happens for people on a spiritual path that when you come and you are young and ambitious there is a part of us that really thinks we are extra special and we are more special than all the other people we are practicing with and we have this extra connection to the divine. And maybe it is that specialness and it is linked often with a naïveté or a narcissism, and maybe there is point in there path where we say oh, I am like everybody else and sure I am special and they are special and that is okay. And I hope that anybody listening to this becomes that exception. For many of us it won't, and we can still live radiant, exemplary lives of practice and transformation. I used to think that wasn't enough and now I do. Mariana Caplan: I am going to bet that most hard-core practitioners, at least if they started young enough, there is some way that inside that is like, yeah, I am going to rise. I am going to do something that the others can't do because my longing is greater, my passion is deeper, my diligence and commitment to practice is more intense. I hadn't met the thousands of people that I met later to know that it was quite similar. We all love the divine. We've all perceived the spark of truth. And here we are as companions on the path many years later. And I find myself in great company, and I don't need people to be extra enlightened in order to feel that they are diligently proceeding along the path. And with discernment, increasing discernment, we become more effective and more refined and more capable in our service or in our work, whatever that is. I think. Tami Simon: Well, one of the things I love about you, Mariana, is that you don't shy away from any of the big thorny questions in spirituality, you know? Like this question we are just talking about. Or the next few that I am going to bring up that you are willing to discuss. Tami Simon: Yes, you are willing to go right into it. So, you mentioned this term "enlightenment" and it is a term that I think needs discernment brought to it. I mean, what the heck are we even talking about? What are we talking about? What is this word…what could this word mean? What does it mean to you? Mariana Caplan: So like we said earlier in the conversation, when I am inclined to make a really strong argument in one way, I am very often aware that there is a counter argument that is equally valid. And I say that before I respond to this question because largely I am inclined to say that enlightenment is almost a defunct word. It doesn't seem to mean very much anymore. And it seems to get in the way quite a bit. I think it is overused. I think that when people talk about enlightenment in spiritual circles and everyone kind of nods their head a little bit, like we are talking about the same thing, that we know what we are talking about, and I can't hear that word without having the question you've just asked. Well, what exactly is that? In the Yoga Sutras, for example, they list many, many levels of enlightenment, so what is often referred to as enlightenment and then somebody becomes an enlightened teacher and so forth, is like a very baby level of enlightenment. And then there are these degrees of enlightenment, not degrees that are traversed in months but in mega-levels of expansion that really go without end. And so that is on one side. And then when I hang out with my Buddhist friends or listen to a really good Buddhist teacher talk about enlightenment, I find myself appreciating that, because if we dis the idea of enlightenment too easily we run the risk of convincing ourselves that something great spiritually is not possible for us. So I think there is a way and I am really only coming back to this in the last several months where I am kind of open to enlightenment again. Maybe not for myself but…where there is a possibility awakening. But even so, there are a lot of people and a lot of popular teachers who have had profound spiritual awakenings and those awakenings still haven't come to bear on all the different structures of their lives. And that is okay. The knowledge can still be useful. But the process that I am after or that I talk about a lot in this book of integration is still taking that awareness and letting it come to bear on our body, on our breath, on our child raising and our relationships and everything we do. And I think that is the kind of awakening or integration that is more needed right now. Many years ago when I interviewed a certain teacher for the first time, and he had had a large enlightenment when he became a guru back in the late 60s or early 70s and then after three years the enlightenment went away and he entered into this ten or fifteen year dark night of the soul that he speaks about very elegantly…what he said at that time, and I was like a spiritual kid interviewing him and I was so impressed, and he said that in retrospect he saw that the light of his enlightenment had to be sacrifice in order to illuminate what was still dark within him. And knowing Claudio now, many years later, he is a refined man who has done so much good in the world. So I find that more attractive than a lot of what we see on the spiritual scene in the name of enlightenment. I aspire to something like that more. Tami Simon: So just to dig into this a little bit more. Tami Simon: I certainly understand what you mean about all the sort of confused claims to enlightenment and to people thinking that they are there, they have arrived, but it is obvious to everybody else that they've got a long way to go in certain parts of their life. I get that. What I am curious about is when you say in the past few months that there is an opening in you to what this might mean in a genuine way that is not that, not claiming something where there is still a lot of transformation in the person's being, in other parts of their life that hasn't happened, but what it could be on the other side of the equation. Can you talk more about that? What could enlightenment be that would be meaningful? Mariana Caplan: Maybe it could be a profound integration. One of the definitions of Samadhi is integration. That I can connect to. But not just like a psychological integration, but maybe…I think Jung was great in terms of how he described individuation. It could possibly be a human being that has a consistent access to an objective awareness of reality, and then that that awareness really has come to bear on the different structures of their lives with the kind of consistency that makes that person genuinely useful and effective in a way that is uncommon. That is just my best guess in the moment. Tami Simon: Well, okay, just to keep going a little bit. Because you've interviewed a lot of different spiritual teachers and spent time with them. And people often ask this question to me, and I don't know how to answer it, but it is why I am going to ask it to you. They say, "you know, Tami, so who have you met who is enlightened?" And I think, god, why are you asking me this question? Come on. I am trying to do a good job. I am trying to ask good questions. I don't know. You know? That is too much for me. But I am curious, how would you answer it? Given what you've just said, that continuity of being able to be integrated. I guess what you would be implying would be at all times? Have you met anybody like that? Mariana Caplan: What? I missed what you just said? What I am implying is what? Tami Simon: That they would be integrated with this bright light of awareness at all times? Are there people like that? That you've met and spent time with? Mariana Caplan: Well, this is what is so interesting, and this is why I have met definitely one person, but this is after…between the teachers and scholars and the people imagined to be enlightened? You know, maybe a couple of hundred over the years. And seeking out the best of them. I definitely met one. And then there is like a small handful. Tami Simon: Was it someone you spent enough time with that you really kicked the tire? Mariana Caplan: Yes, his name was Yogi Ramsuratumar. And he was a saint in South India, and he died nine years ago, and I was with him daily for about nine months. And he was like one of the saints of old. And I experienced something then, and I was only twenty-five, but it had a…it was something like when I read the Yoga Sutras and I hear these really high levels of enlightenment described that I think generally are really theoretical to read about. I have a reference point for what I am reading. And it shifted the whole bar. Right? I am really glad I met him and hung out with him for a long time when I was really young, because it raised the bar like up. It raised the bar, like headed toward…it raised the bar to a place I never even knew that bars could go to. And it was a privilege and it put other things in perspective. But I met with some great people over the years. I think most of them have died. I met Vimala Decar before she died. I met her many years ago. She was Krishnamurti's informal successor. And I don't know if she was enlightened or not—but highly integrated human being, refined. I met Krishnamurti a couple of times. But not so many. But I have met a lot of wise people. And I don't need them to be enlightened anymore. Do you? Tami Simon: No. Tell me though what was so special about Yogi Ramsuratumar? Mariana Caplan: Okay. I met him when he was in his 70s, and his so-called enlightenment would have happened in his 30s, so I met him about forty years into it. And, you know how I like things to be so practical, and when I find myself describing this it sounds so cosmic, so I am aware of that as I describe this. But it was like the man who would have had the shift forty years before I met him in which he was very theistic. It was all very in god consciousness terms, but that his awareness would have begun to merge with god consciousness. Like the man was still there as a shell, but the most radiant awareness that any of us had ever conceived of was pouring through this man. He was almost transparent. Like you could almost stick your hand through him. And one could sense that over those decades with that increasing radiance, that there was more capacity. And you could sense that he had just kept going and going and going, he had never stopped. So it was like a man, the shell of a man, who had been like blasted into the sun. And he was just burning and so loving, I mean, so capable and he didn't like miracles but he did them. He didn't like show. He didn't like the showiness of miracles like Sai Baba or somebody like that. But he did them on the side. Tami Simon: Like what kinds of miracles? I like the cosmic part of you, Mariana, as well as the rational. I like both. I like both. Mariana Caplan: [laughs] And he fell on his knees in divine ecstasy! So I watched him do physical healings a number of times, whether it was on bones or cancer or things like that. And there was a particular day that I came in and he was involved…oh, it is so hard to describe…but he was involved in working out something with some invisible beings in the room. And I tell you, Tami, I could have a thousand people do that in front of me and I would be completely disinterested and skeptical. But this guy didn't leave me any room for doubt. And I watched him work with subtle beings and subtle forces and we sat for about an hour wondering what was happening until it shifted palpably in the room and then something resolved itself. And there are a lot of miracle stories, but I have to say quite honestly, they were building a temple at that time. He resisted the temple being built until right before he died. And he made sure he died before the temple was done. And in an Indian summer it is usually about 120 degrees in South India, and there would be these big darshan meetings, where two hours twice a day he would come and bless the people. And while the temple was being built, every day he would just go out with the workers up on the rooftops, of wherever they were working, and spend the entire time of the darshan just blessing the workers and being with them. And she was like this bleeding heart. It was like watching a heart without skin just bleeding with compassion. And I used to stay up late at night and walk by the house where he stayed and there was just always this chanting going on. It was so beautiful. But that is only the real saint I ever met. And I looked and searched and I don't do that anymore—but I used to travel far and wide for them. And it just put things in perspective. You know, I live here in the Bay Area and every night of the week I could go see some guru. The coffee shop here is called Avatar. I mean, there are enlightened people around all the time, and I'd usually rather go to the movies. It is terrible, but it is true. Or hang out with really good company. Humble and sincere company. People who are practicing and doing their lives. Is this what happens when you get older? Tami Simon: Well, I think one of the points you make in Eyes Wide Open and you make it really strongly—and I think it is a very important point—is the problem, the danger, the destruction, that comes when people think they've arrived someplace but they haven't arrived actually to a final enlightened resting place. And I am curious for you to talk a little but about why that is such an important point, do you think. Mariana Caplan: Well, because it limits us. I think our capacity of what the path is is largely defined through the mind. Right? We are identified with this egoic being, pretty much most of the time. Most of us think we are what we think we are. And then we've had these insights and then we gain these teachings. But I think a lot of what we conceive of to be the path is within the construct of our concepts. So within that, there is a lot of expansion possible, and we may expand into a certain level or a certain kind of insight and then we read the books and it seems to match up what we read, in terms of our experience, or some teacher validates that that is enlightenment. And it just seems so limiting. It seems very limiting. And if the individuals who are needing to experience themselves as enlightened are also needing to become teachers and proliferate that enlightenment, then they spread that limitation. And it just seems from everything I have learned, because although my views are sometimes, well not cynical, but although they are very pragmatic, I am desperately passionate about practice and expansion and the path and endless growth. And I think it is just that. It is like there doesn't need to be an end. And wherever that end is, it is not where our concepts of that end are going to be. Meeting that yogi that we were just talking about, it convinced me that there is no end. There is no end. No end to our growth. No end to integration. There is no end to enlightenment. So the idea of having arrived seems kind of childish and limiting. When I interviewed Joan Halifax many years ago I was writing the book on premature claims to enlightenment, and I was all on this rampage on people prematurely claiming enlightenment and this is on behalf of the perspective that there is always another viewpoint. She said, oh, she thought it was kind of cute. She said, "I work. I teach Buddhism in prisons, and those guys have real problems." She said, "When somebody pretends to be enlightened, it is just like when we used to play dress-up in our mother's clothes. It is like playing dress-up. It is kind of sweet. It is just a stage and it will pass." And I remember just appreciating that. I like when my views get knocked down. Maybe not right in the moment, but definitely in the next moment. Tami Simon: How did Yogi Ramsuratkumar show you the endless nature of the path? I mean, here is somebody, if anybody would have arrived, at least from your estimation, it would have been him. But you are saying he showed you some endless aspect? Mariana Caplan: Many days I saw him most of the day, and often into the night. He was always practicing and serving and you could feel in him like he was so actively involved in this longing and love affair and surrender and pouring out of love from that place. He wasn't stopping. I mean, we could argue that he was at a certain place and he just kept giving from that place, but it had this quality of endless moods and endless surprises, and day in and day out, without cease in the way that Amma gives hugs, without cease, he just kept going. So we are really talking about transmission. That is really how we perceive something and that is the advantage of a living teacher. One of the most paramount advantages of a living teacher is that through the way that truth is alive in them, they convey that experience into another person. It is literally passing on the fire of the light of awareness from one person to another. So really he did it in that way. That is the advantage of being with the great ones, I think. So he did it that way, but really through his example. Not by telling us that. But through being that. Tami Simon: One of the things that I love about you is that you have this great combination of pragmatism, as you mentioned, and cosmic appreciation of the love affair with life that is possible. And here you are, you are talking about what a teacher can bring, this possibility of transmission, but I imagine pragmatic listeners saying something like, "I'd like to expose myself to the benefits to the kind of transmission that can come from working with a teacher. But I am not willing to work with all of these imperfect human beings and all of there terrible psychological power issues, etc., so I think I might just skip it." And I know this is a question, a conundrum, that you've studied a lot. How have you made peace with that? How can people get the benefits of transmission, but without having to be in relationship to this psychologically confused person and all of the sort of terrible exchanges that can come from that. Mariana Caplan: Yes, such a great question. So we are back to the issue of discernment, right? And earlier we were talking about it as a shield, because there is a lot in between. There is a lot in between these terrible psychologically messed up teachers and someone like Yogi Ramsuratkumar. And I think maybe even the small majority of teachers are on the spectrum in between. There are some really good teachers. And the way that we armor ourselves or protect ourselves is through the cultivation of discernment and part of discernment is going to be study, you know? It is reading and learning about what we are looking for and what to watch out for on a spiritual level. I think another huge area of discernment, for any of us in the Western world, is the psychological and I believe that we need a deep psychological education. And not by going to grad school and studying counseling but through really investigating our own psychological process in depth. And that is going to be really important because let's say we find ourselves in front of a teacher with great charisma and power and some radiance, and we are impacted by it. What we need to know about ourselves in those moments is how our psychological make-up is likely to relate to that person, not generally but specifically. How we tend to idealize what we do in relationship to power, what we do when that person is a man or a woman, if they are a lot older or a little bit older. We need to know how to look at our, not only look at ourselves in that way, but also look at the teacher in that way. And most of that stuff is unconscious. So a lot of the attention in this particular book is devoted to psychology and its importance to bear on the spiritual path for western practitioners. And that is something that I am becoming more and more passionate about as the years go by. Not as an end point, but as a necessary and indispensable tool and part of the path, especially if we are going to be working with the bigger fires, the spiritual teachers and communities. And I am all for it, to avail ourselves to that. Because there are certain things that are available that aren't available elsewhere. But the best protection is our own self-awareness and our own discernment. And I want to underscore the quality of self-honesty and continued self-investigation that is required. And then we can start to separate what it the cultic dynamic in the community, what might be the weak parts of the teacher, what might be the weak parts of us. And then from there, how are we going to still benefit from it? I mean, these are the delicate questions. And I think they are the questions of our times, too. Like I think that they've probably always been questions. But they are questions that are really relevant right now. I hear them a lot from clients. I get the therapy clients who have been burned by spiritual teachers or really struggling with the path or who have been on the path for thirty or forty years and are not satisfied. Those are the people I work with a lot. And this question comes up over and over again because we have to open our hearts and we have to give or trust, at least to a certain degree, to receive the benefit. And we want to do that wisely. So that is like a living question of discernment, or whatever we like to call it. Tami Simon: I wonder if you can share a little bit from your own experience. I know you have been in relationship with a spiritual teacher, working with a spiritual teacher, Lee Lozowick, and what you've learned about your own psychological make-up and how that has informed the relationship and how you've grown in the relationship. Mariana Caplan: Yeah, great question. So I met and became a student of my teacher when I was twenty-five. I'd had a number of spiritual teachers before then, shorter term. And so I feel like I grew up on the particular path. So I want to make a couple of distinctions because that is what I like to do. One is John Welwood, who writes about these subjects as well. He makes a distinction between relative and absolute authority. And absolutely authority is a spiritual teacher who has a greater degree of realization, who may be considered enlightened if enlightenment is used in that particular tradition. And then relative authority is our teachers who are wise and know more than we do and guide us along the way. What happens often in the guru/disciple construct (it is like a construct of a relationship) is that whether the teacher is an absolute authority or not. The construct works by relating to the teacher in that way. That this teacher is a transmitter of truth and as a student you…after surveying the situation as long as you need to, you avail yourself to that. You give your trust. So the challenge is that when we do that, that we give our trust and we perceive the truth and it is laden with projections, even in the best of circumstances, so that was my experience right there. There was perceiving something truly great and tapping the great dharmic truths through my teacher. And then all the unconscious needs and desires for long and belonging and validation and being taken care of and having a great spiritual father who is trustworthy—those all come together. It is like the psychological…the most neurotic and the most divine aspects of the relationship are braided together in these little strands so that you can't even take them apart. And I am speaking from my own experience, but I see this generally from a lot of people, maybe a majority of people, in some way to a greater or lesser extent. And then comes a certain point…and it is said in a lot of texts that that is part of it, that that is part of that phase of the relationship, that will inevitably be followed by a phase of disillusionment and having some of those illusions shattered. And then you have a process in any long-term student-teacher relationship of the awakening of truth in your own experience. So I've been in a fifteen year relationship, and there has been merging. I like the metaphor of intimate relationships for this, because right when you meet somebody and you fall in love, there seems to be some combination of an essence attraction, something true and beautiful in your perceives something true and beautiful in that other person. And that sparks this great love affair, and often something neurotic and contracted in your also links up with that part in that person. That is my experience as a woman and as a therapist for couples. And then there is the merging and then there is a process of disillusionment and kind of separating out and individuating ideally in order to walk a path of life side by side as mature adult companions. And I think that is my experience to date in a long-term relationship with my teacher, of a childish divine insight and a childish merging and a childish disillusionment, because it was my projections and my disillusionment and then the process…the last chapter in the book is Om Mani Padme Grow Up. And then a process of growing up as a woman and an adult on the path in relationship to my teacher. And it has been a very honest relationship, and with great respect to him, because all my questions and doubts and frustrations he would always make space for in the community. And I would write my angry letters and he would read them in community meetings and we would discuss my points and always. He would put them in this magazine. So it is like that, but it is still a process. Tami Simon: I want to ask you about this title of the last chapter of the book: Om Mani Padme Grow Up, which you mentioned. This idea that becoming a spiritually mature person is part of the goal of being a spiritual practitioner. And what are the qualities do you think of a spiritually mature person, someone who has grown up spiritually? Mariana Caplan: I didn't write about the qualities in the book, so you are going to get them off the cuff from me. Tami Simon: I like off the cuff. When you think of spiritually mature people, what are their qualities? Mariana Caplan: They can both think for themselves but also respect and defer to higher authorities, wiser people. Both. A spiritually mature person is embodying or has integrated many of the ideals that they aspire to, so we would see that in their actions. If you hang out with that person for a day and go shopping with them and run into a bunch of kids and a traffic jam, not that they have to be impeccable, but it would be demonstrated in the actions of their lives. I think a spiritually mature person would have a certain degree of time and attention dedicated to other, whatever their service is, whether it be their job or some project or mothering, but really have enough space in themselves that it is really available to the question of how can I be useful, how can I serve effectively. I think a spiritually mature person would definitely not be righteous about their spirituality. They would be able to talk about other things, ideally laugh. I suppose you don't have to have a sense of humor to be spiritually mature, but at least relaxed about it. That a spiritually mature person doesn't need to wear their spirituality as a badge. And it is simple phrases that somebody walks their talk. And who has a certain degree of refinement. Because there are a lot of good people, and they are not necessarily integrated, spiritually developed human beings. They are just great people. Good people. And often better than a lot of righteous people on the path. But a certain degree of refinement and grace. And I think somebody who keeps growing, who just knows that they are going to keep growing, and is dedicated to a path of practice without needing to arrive at an imagined goal. They practice because it is a good way to live. I hope to become one of those people. Tami Simon: Wonderful. I just have one final question for you, something I have admired about all of your books, including Eyes Wide Open, the new book from Sounds True. Is that you have this gift for asking the right question, I mean, the kind of question that I am interested in [laughs]. Just kidding. So what is the main question or questions that you are asking right now? Mariana Caplan: I am going to think about that for just a moment. I have a burning question about integration. And although I write a lot about embodiment and integration in the book, I really want to know more and more about how that happens in my body and in my personhood. I am convinced that it is possible to penetrate the cells of the body with increasing awareness and that the psyche and the spiritual awareness can come together at levels of increasing refinement. And I want to know how it is done for me, how it is done most effectively, and necessarily how I can share that with other people. That is one of the questions. And I want to know how I and somebody else can be most genuine and authentic as a human being and real and realistic with our capacities without sacrificing our greatest spiritual possibilities, without losing that spark of vast possibility. And then I want to know how to be most effective. Most effective in life. Yeah. And I would like to do all of that while enjoying myself. And that is something that wasn't valued during the early years of my path. Tami Simon: I certainly wish that for you, Mariana. Mariana Caplan: I wish I could ask you all of these questions, because I am really interested in your responses. Tami Simon: Well, you and I will keep talking. And in the meantime I want to thank you for being with us on Insights at the Edge. Mariana Caplan, the author of a new book from Sounds True, Eyes Wide Open: Cultivating Discernment on the Spiritual Path, with a wonderful foreword by psychologist John Welwood, available at SoundsTrue.com. Many voices, one journey. SoundsTrue.com. Thank you for listening.